Nowadays the German cuisine has a lot of foreign influences. "Pizza", "Döner" and "Hamburger" are as usual as our traditional meals. In this category we list and explain some typical German dishes. "Currywurst" is a fried sausage with a spicy tomato ketchup and some curry powder. We love to eat it with "Pommes" (= French fries). I think it is the most popular fast food we have in Germany. Usually you buy it as street food; it is not common to cook this at home. The origin of the "Currywurst" is in Berlin where you will even find competitions on who can eat the most spicy sausage. A very traditional dish all over Germany, and your safest bet in any typical German restaurant, this breaded veal cutlet (Ger. "Kalb-Wiener Schnitzel") can also be made with pork (Ger. "Schweine-Wiener Schnitzel"), turkey (Ger. "Puten-Wiener Schnitzel") and chicken (Ger. "Hähnchen-Wiener Schnitzel"). The meat is dipped in flour, egg and breadcrumbs and then fried. Although usually served plain with a wedge of lemon, you can also choose it with a sauce: "Jäger" is a mushroom sauce, "Zigeuner" sauce has red peppers, onions, mushrooms, tomato paste and red wine, "Paprika" is a tomato sauce with red peppers and paprika, "Käse" is melted cheese, "Rahm" is a pepper cream sauce. 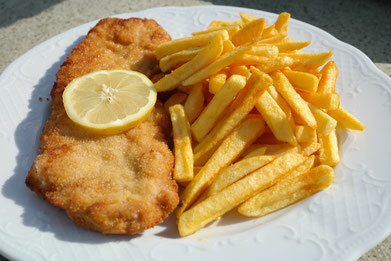 "Cordon-Bleu" is actually a Swiss variant: the Schnitzel is filled with ham and cheese. "Weißwurst" (Bavarian veal sausage) is typical for Bavaria in the south of Germany. 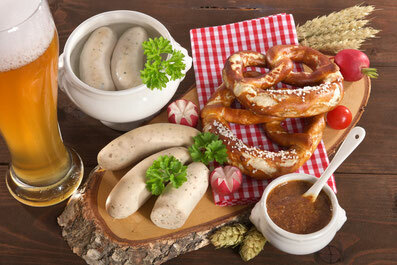 It is served together with sweet mustard and often accompanied with "Brezel" (pretzel) and "Weißbier" (wheat beer). 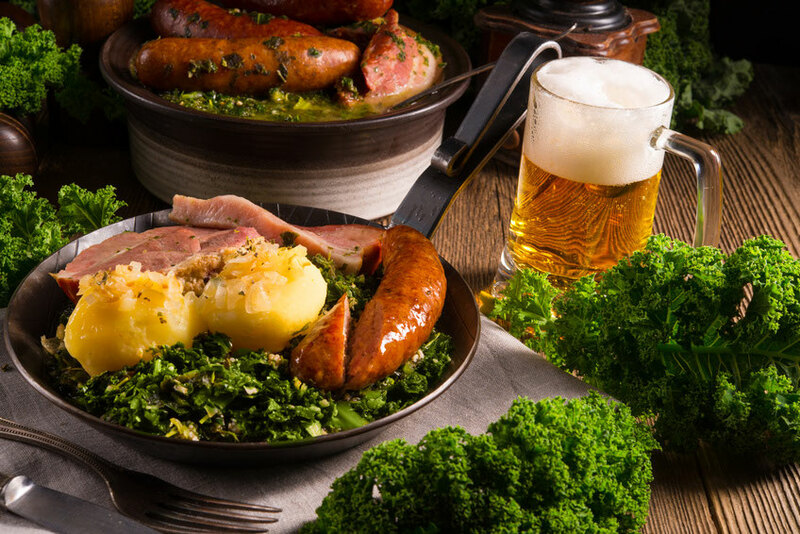 The sausage is boiled and the tradition says that you should eat it before 12 o'clock ("The sausage should not hear the 12 o'clock bell!"). 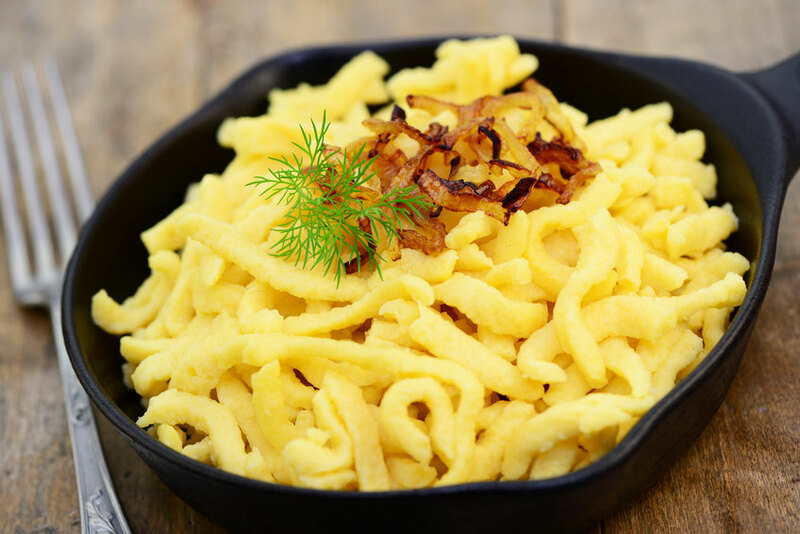 Spätzle is a special soft egg noodle, which we relate to the Swabians (living in the southwest of Germany). It is best if it is handmade and fresh. 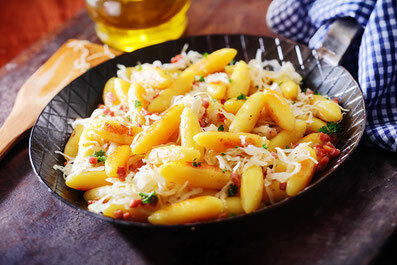 There are different dishes with Spätzle: Käsespätzle (cheese noodles), Linsen mit Spätzle (lentils with "Spätzle") and often it is a side dish to meat with sauce. The taste is similar to pasta, but softer. You can also find fresh Spätzle in the refrigerated section of the supermarkets, so you only have to heat them. Yummy slightly different fried potatoes. You´ll find these in any restaurant and they are so easy to make at home too! Add a few whisked eggs and you´ll have a full meal. What is one of the first things that a German misses abroad? The German bread! We often find foreign breads boring or even horrible. 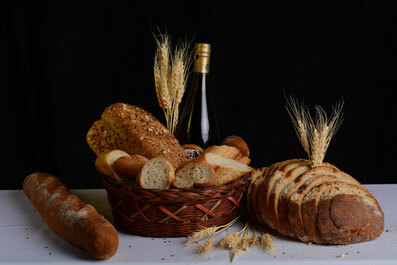 We have uncountable varieties of bread: from "Weißbrot" (white bread) till "Vollkornbrot" (whole grain bread); there´s something for all tastes. In times of the "low-carb hype", I think the usual consumption has dropped a little. But for the generation of our parents it was normal to eat bread (mostly with butter and honey or jam) for breakfast and bread (mostly with butter and savoury toppings like ham, cheese, cold meat) for supper. Enter into a German bakery and smell the scent of freshly-baked, crispy bread! Yummy! For the lovers of cakes: the "Schwarzwälder Kirschtorte" (black forest cake). This cake is one of the most popular cakes in Germany, created in the south of our country. 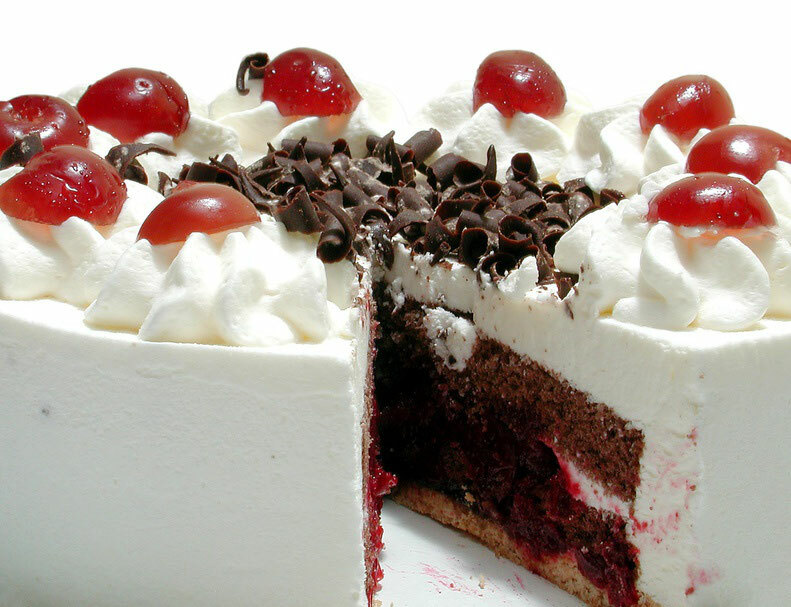 It consists of a chocolate sponge cake, cherry marmelade, cherry schnaps, whipped cream, cherries and chocolate shavings for decoration on top. You will find it nearly in every pastry shop. 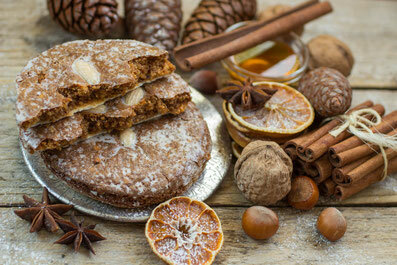 Recommendation for those of us with a sweet tooth: try as many German cakes ("Torten" and "Kuchen") as possible. They´re all delicious! Germans love their beer. And they insist on their "Reinheitsgebot" (purity law) which says that beer should be produced only from hops, malt, yeast and water, nothing else. There are lots of different types, depending on the region. The most common is Pils. Altbier is drunk in Düsseldorf, Kölsch comes from Cologne. Export, Weizen, Helles and Dunkles are other popular beer varieties. Many breweries brew their own beer, and each tastes different. 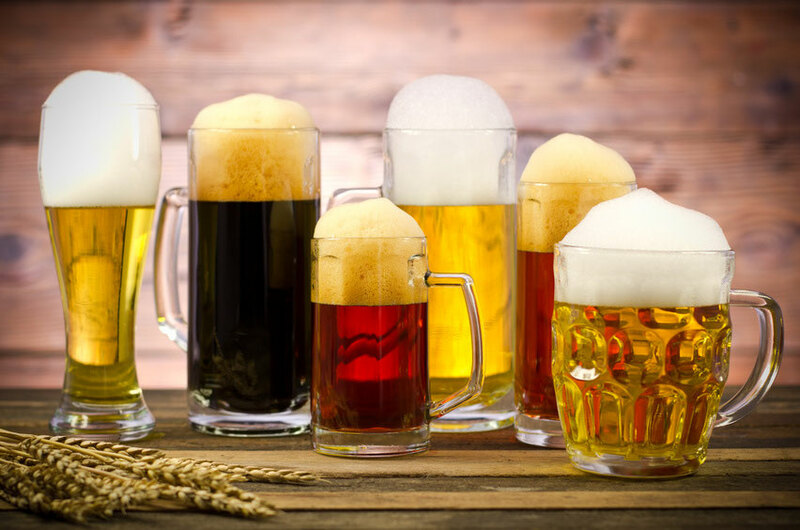 And, of course, there are also non-alcoholic varieties, of which alcohol-free wheat beers according to experts tastes best. 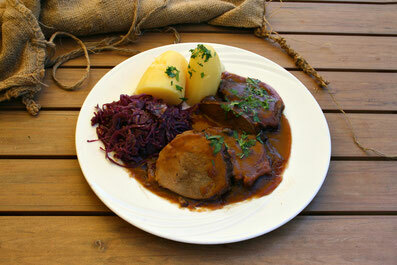 Stuffed pig's stomach: This dish became famous because it was the favourite food of our former Chancellor Helmut Kohl. I know, the name sounds unappetizing, but the taste is better than the name. 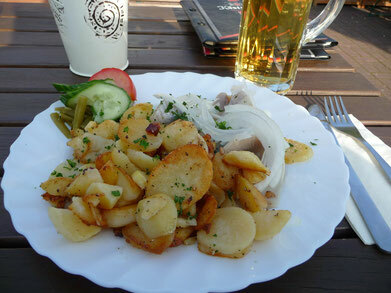 It is a meat dish made with pork, sausage meat and potatoes, which is sliced and fried. It is often eaten with potatoes and sauerkraut (sour, finely cut cabbage). It is very popular in the Palatinate. These are baked noodles made of flour, potatoes and egg and fried in butter. 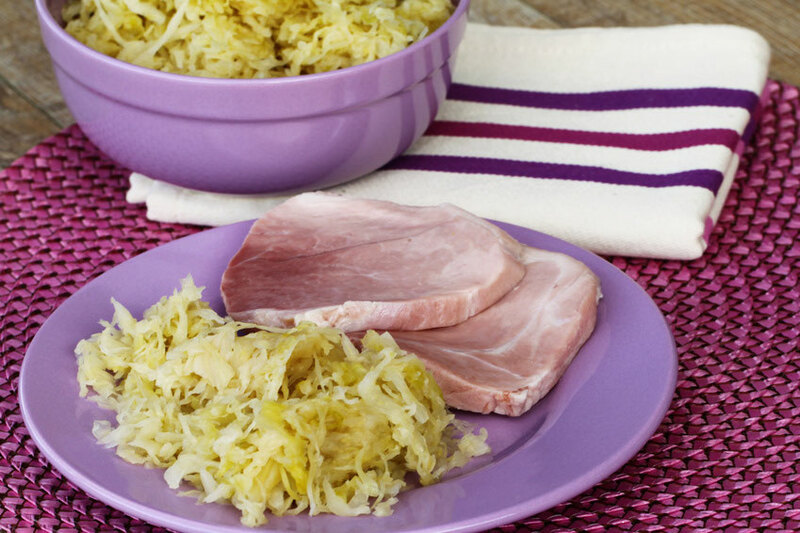 They come from Southern Germany and are usually served as a side dish. Flammkuchen (tarte flambée) is consumed in the Palatinate and in Baden. Even though it looks like pizza, it tastes different. The base is made of bread dough. 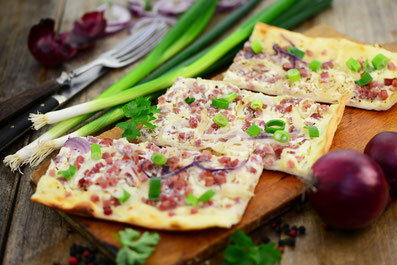 The toppings for the classic tarte flambée are only onions, bacon and sour cream. It is baked briefly in a very hot oven, cut into pieces and served on a wooden board. 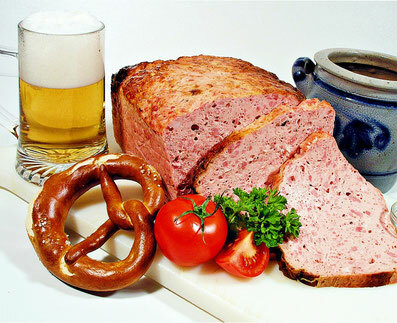 Meatloaf is widely eaten in Germany. We Germans like to eat it as a snack, with or without mustard, in a bun, and this is how it is often offered in the butcher's shop. Previously, the meat loaf contained liver, though today this is not the case. This speciality has no "Käse" (cheese) in it either, despite its name (which describes its shape). Meat loaf is made with sausage meat. 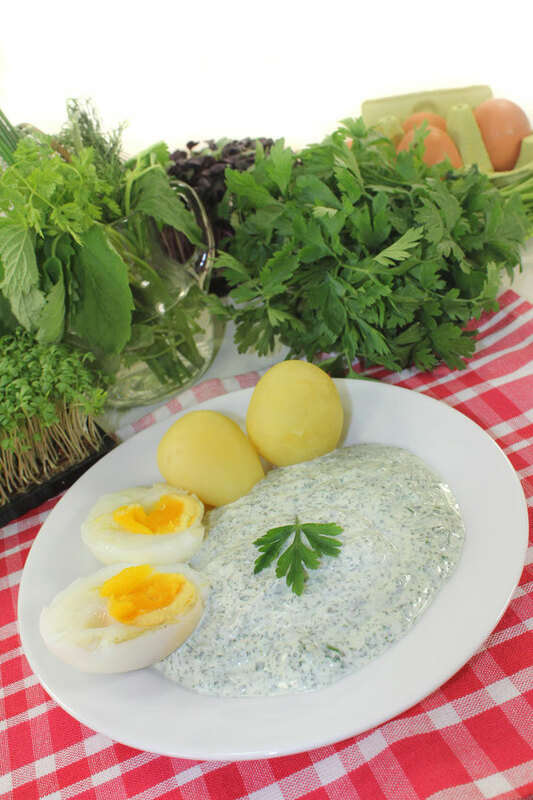 The original Frankfurt's Green Sauce is mostly served with fresh boiled potatoes and hard boiled eggs. The traditional herbs which are used for this sauce are borage, chervil, cress, parsley, salad burnet, sorrel and chive. 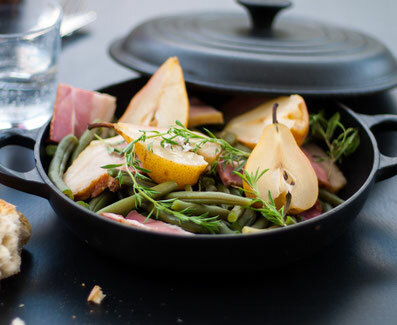 The season for this dish starts on "Holy Thursday" and ends with the first frost in autumn. "Rippchen" is cured and cooked pork, usually served with "Sauerkraut" and mashed potatoes or bread. 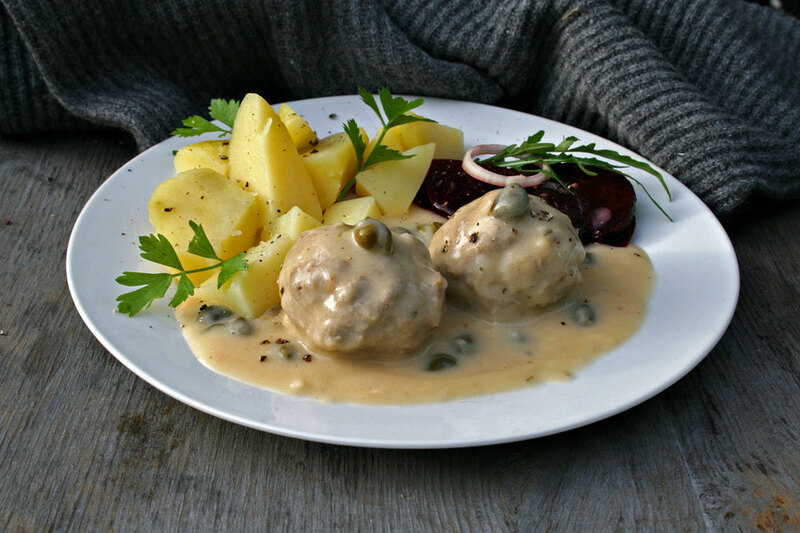 This dish is very popular in Hesse. In the past, Rheinischer Sauerbraten was made with horse meat. But today we prefer beef. Before cooking, the beef will be marinated several days in vinegar, water or wine, onion, carrot and spices, such as laurel, cloves and peppercorns. The braised beef can be served with dumplings and red cabbage. If you translate the name of this dish literally, it is "half chicken", but this dish has nothing to do with meat! 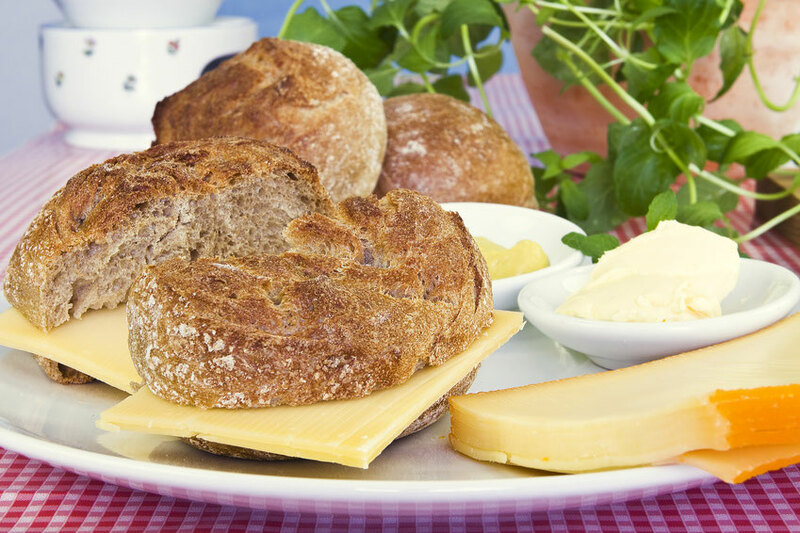 "Halve Hahn" is the rhenish expression for a rye bread with cheese. You take a half bun, butter it, cover it with semi-mature Gouda (cheese), pickled gherkin, mustard, onions and some paprika powder. Ready! Usually served in the "Kölsch Kneipe", the Cologne breweries and pubs. It is made with grated raw potatoes and onions, from which a dough is made together with egg and flour. 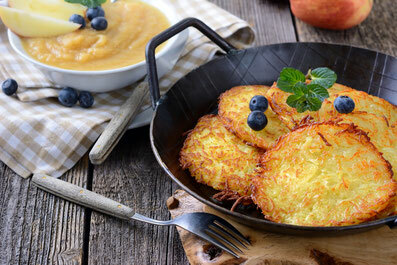 This mixture is then fried in small portions in a pan in hot oil to make "potato pancakes". This is green cabbage with a special local sausage called "Pinkel". This dish is particularly widespread in North West Germany. In addition to the sausage, other smoked meat ingredients are usually served. We eat this - as so often - with potatoes. 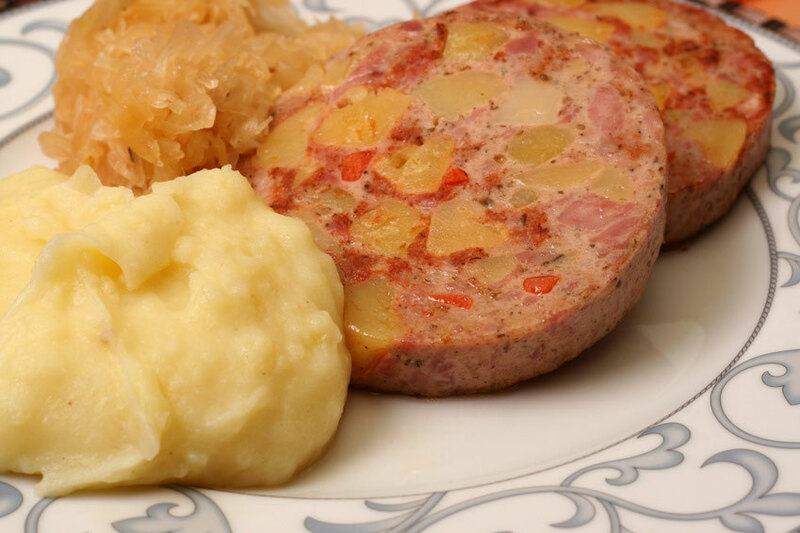 As this is a relatively greasy dish, Germans often drink schnapps as a digestive afterwards. Pears, beans and bacon are a northern German dish, specifically from Hamburg. 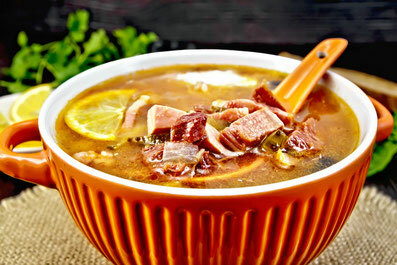 A kind of hearty stew with a combination of savory and sweet. 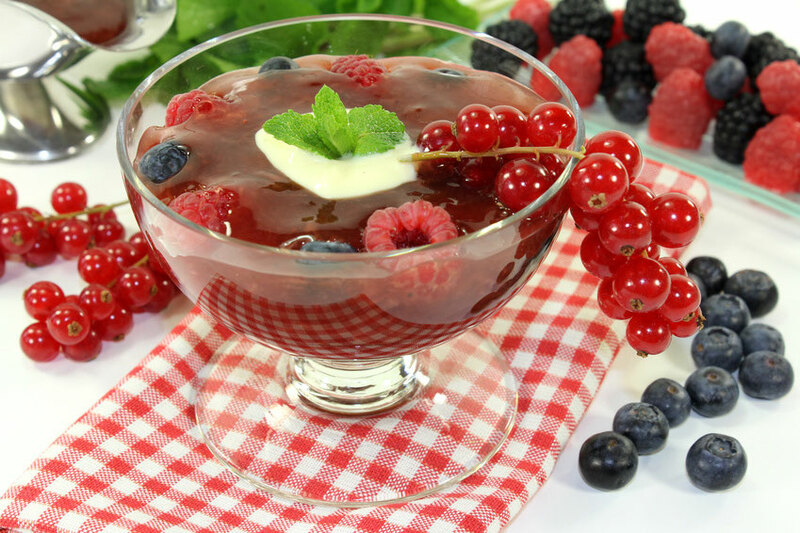 Red fruit jelly is a dessert which is cooked from many red fruits. 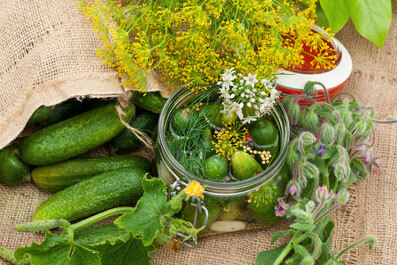 Ingredients are mostly strawberries, cherries, raspberries, currants,... what you can find in the garden at present. As the red fruit jelly tastes slightly sour, it is mostly served with vanilla sauce or sweet cream. Königsberger Klopse is a Prussion specialty. The meatballs are served in a white sauce with capers lemon juice and anchovies. Boiled or mashed potatoes are very popular choice as a side dish. Soljanka was one of the most popular stews in the former GDR. 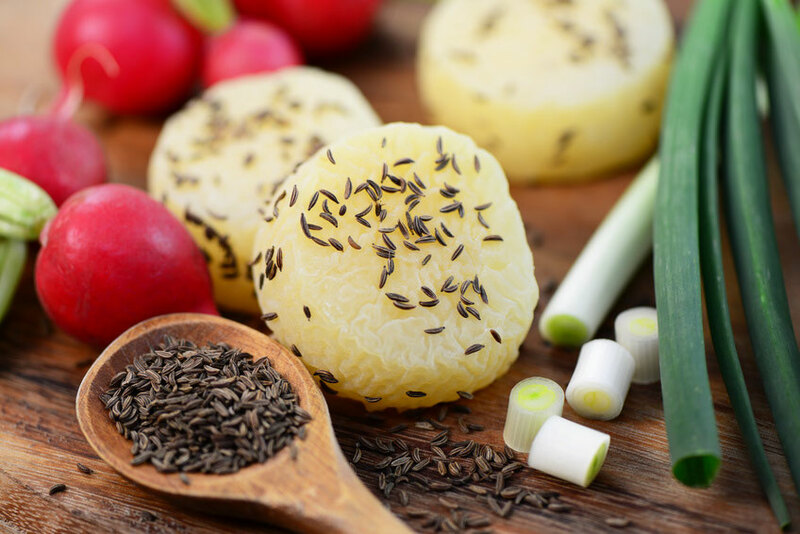 There are different types of Solyanka: with meat, fish or mushrooms. The taste is sour and sharp. The Spreewaldgurke has cult status in Eastern Germany. These cucumbers are hand-picked even today and are pickled with fresh herbs and spices. The "Spreewaldgurke" has a sour taste and only a few calories. We simply eat it sliced with onions, vinegar, oil, salt and herbs together with some bread and cider. 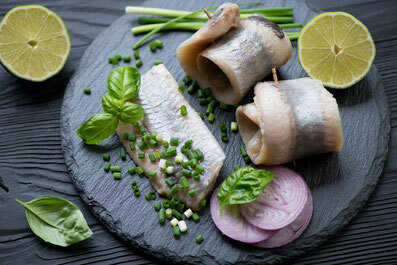 "Pickled herring" is a piece of herring, which is rolled up together with a cucumber and is pickled in vinegar and salt. People say that it helps to recover faster after a late night party with too much alcohol because it has lots of minerals. Nuremberg gingerbread - there is no Advent season and Christmas without gingerbread! This sweet and spicy speciality is offered only in the cold season and is definitely a part of every "Nikolausteller" (plate with sweets which is gifted on 6th December to celebrate St. Nicholas Day). It is made with honey, almonds, nuts, candied orange peel, candied lemon peel, honey, flour, sugar, eggs and of course the special Christmas spices. On opening a packet and smelling it, I invariably feel transported back to the Advent seasons of my childhood. Very clear favorite! 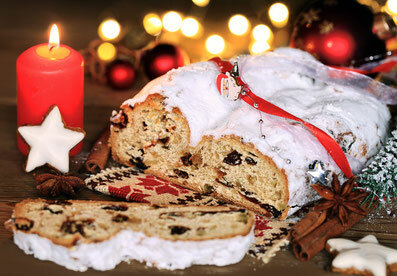 "Dresdner Stollen" is a very famous bread-like cake covered with a lot of powdered sugar. It is eaten mostly in the Advent and Christmas time, outside of the season you will not find it that often in the shops. Stollen is made of yeast dough with dry fruits, sometimes marzipan or poppy seed. Especially the stollen of Dresden (which is located in the east of Germany) has become very famous because of being so delicous. 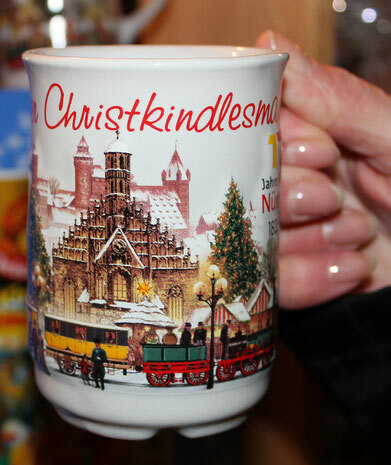 When you visit a Christmas market you must try this hot, sweet, spicy drink. But be careful! The high sugar content makes the alcohol in this mulled wine dangerous.